It’s been a fairly quiet week this week, but one during which I’ve got quite a lot of work done. Nita was working night shifts last Saturday and Sunday and has been working twelve and a half hour day shifts Thursday and Friday ….leaving very few opportunities to get back onto the hills. Tuesday really was the only day but this turned out to be very wet and windy. Although a few years ago we’d have gone out anyway, these days we prefer to wait for slightly better weather. With Nita working part time now and me being self employed it means that we generally have far more opportunities to get out and so don’t have to go when it’s bad. It’s also a question for me, of getting my priorities right. The walks are very important to the works I do and as I don’t, generally get that much out of walking along for eight hours in cloud and rain, it makes a lot more sense to stay in the studio and paint when the weather is really grim. I’ve been continuing to work on the new small paintings for my exhibition at Blairmore Gallery near Dunoon. The work has gone well and I now have four 30 x 30 cm paintings completed and one new 76 x 23 cm piece too. I’ve also started two more 30 x 30 cm pieces and have plans for another two also. The space at Blairmore isn’t vast but in the past when I’ve held exhibitions there I’ve usually included around 17 or 18 pieces including one of the larger paintings or drawings. This year I’m also working on several new small line drawings, (postcard size) and may well include 2 or 3 of these. It’s always about this time ahead of a show that I start to get an idea of what work will be included and an idea in my head of what it will look like. Anyway, I’ve still got 5 weeks so plenty of time to change my mind over and over again ….needless to say, this drives Nita to despair! It’s that time of year again and tomorrow we’ll be delivering the two works for the North Ayrshire Open Art Exhibition. 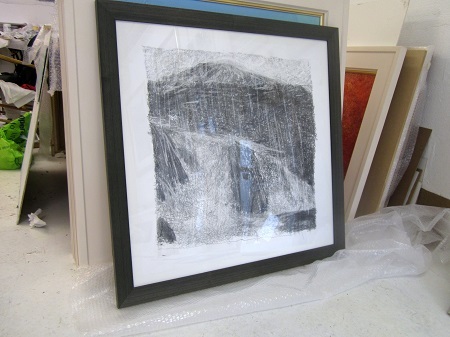 As the works to be hung are chosen by a selection panel, you always have an agonising few day wait to see if your own pieces have made it into the show ….a list of selected works is posted on-line later in the week ….it’s all quite exciting. The best thing to do is to try and forget about it ….and keep your fingers crossed! This year, for a change, I’m entering two of my graphite drawings, rather than paintings. 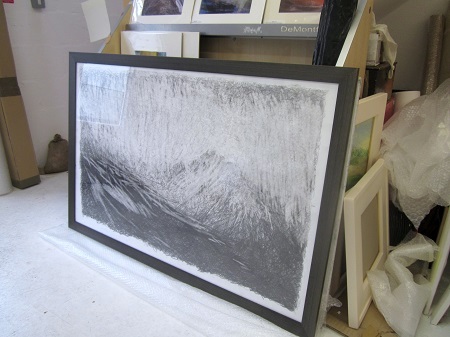 I got them back from the framers the other week and have had a chance to see them in the studio for a short while. Hopefully there will be a good response to them but you can never tell ….they may be rejected ….there’s a lot of competition out there and there are always a lot of entries. Full details about how I get on, in next weeks blog. Our next opportunities to get out on the hills will be from Sunday to Thursday and we’re hoping to make a trip either over to Glen Shee or to Glen Lochy to walk Creag Mhor. We also have to try and fit in a quick trip over to ‘the gallery on the corner’ in Edinburgh as I have some new work for them…..looks like being a busy busy week ahead.